We all recognise YouTube as being the video site on the internet. Sure, there are others – Dailymotion and Vidme for example – but neither of those sites come close to being a rival for YouTube. Facebook are trying their best to compete in the video world, but until content creators make equal money on the platform it’s unlikely that there will be a mass migration. Every minute more than 300 hours worth of content is uploaded to YouTube, so would anybody really be crazy enough to take on Google? In steps unlikely contender LinkedIn who, whilst aren’t trying to replace YouTube, are in a fantastic position to corner a smaller (but still huge in it’s own right) market. Industry, marketing and job seeking are is content not often associated with YouTube, so with LinkedIn introducing native video uploads they may just have found a way to cut YouTube from the equation. Until now, LinkedIn users had to upload content to YouTube and then post that to LinkedIn, but this introduction will mean cutting out the middle man. Not only will this enable users to upload directly, including from a mobile device, but a plethora of analytics will also be available, including watch time, engagement and even who is watching from which company or organisation. LinkedIn are confident that this will increase networking and the frequency in which users visit the site. Currently only 23% of LinkedIn’s 500m registered users visit the site at least once a month, a stat which Microsoft want to improve to compete with other social platforms, and with the introduction of native video uploads it certainly gives users a reason to stay on the site for longer. Like YouTube and Twitter, LinkedIn video will count a view after a user has watched for just 3 seconds, which can lead to inflated (and somewhat misleading) view counts. YouTube doesn’t count a view until a user has watched for at least 30 seconds, which explains why those cooking videos you see constantly gracing your Facebook feed often have in excess of 100m views whereas the YouTube equivalent have way less. There will inevitably be the introduction of monetisation down the line, and whilst users won’t earn money compatible to YouTube, it’s expected that some of the larger companies will be able to build enviable audiences. 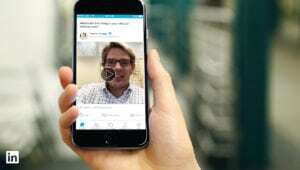 LinkedIn video is currently being trialled by a select number of businesses, but it is expected to be rolled out to all users in the coming months. We’ll be keeping a close eye on the launch, after all Viral Seeding have a track record of successfully promoting YouTube content on LinkedIn, so native uploads should provide to be even more fruitful. Get in touch with Viral Seeding today to discuss LinkedIn video promotion or other B2B video marketing options.